You never know when inspiration is going to strike. Today, it happened as I was driving home from my hair appointment, and feeling grateful for the burst of sunny weather. (We've been in torrential downpour mode here in Connecticut this week and it's yet to hit 75 degrees this year). The sun also made me think of... no joke... photography lighting. I decided I must take advantage of the gorgeous light. Something easy. Hmmm... A cocktail. Something springy. Well, May is National Strawberry Month. Something festive. Cinco de Mayo is in four days. ARRIBA!! Hull and quarter two large strawberries and throw them in the bottom of a cocktail shaker along with four sprigs of cilantro. 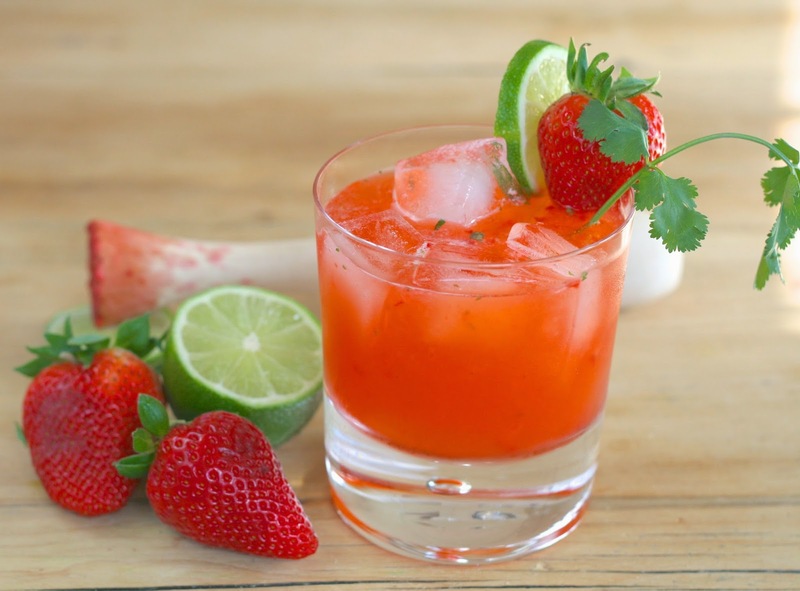 Using a muddler (or even a wooden spoon might work), muddle (crush) until strawberries are thoroughly mashed and the cilantro has become incorporated as well. 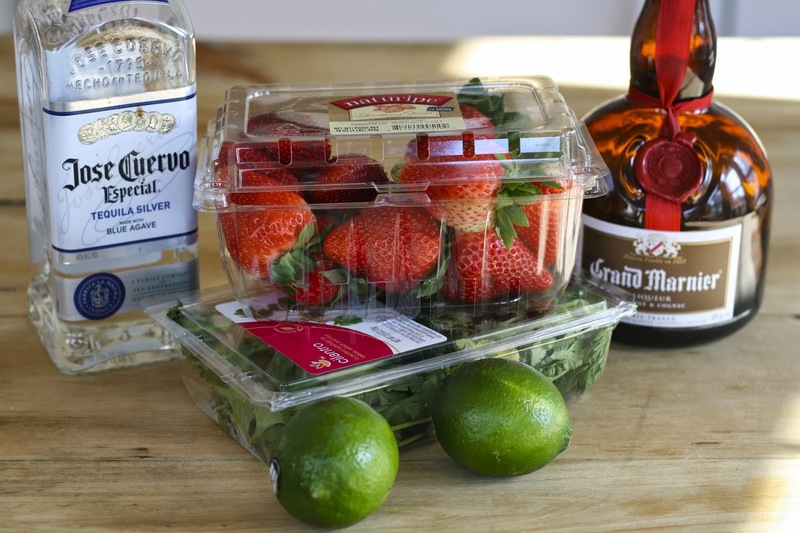 Fill it up with ice, and add the following: juice from 1 lime, 1 ounce simple syrup,* 1 ounce Grand Marnier or Cointreau, 2 ounces tequila. 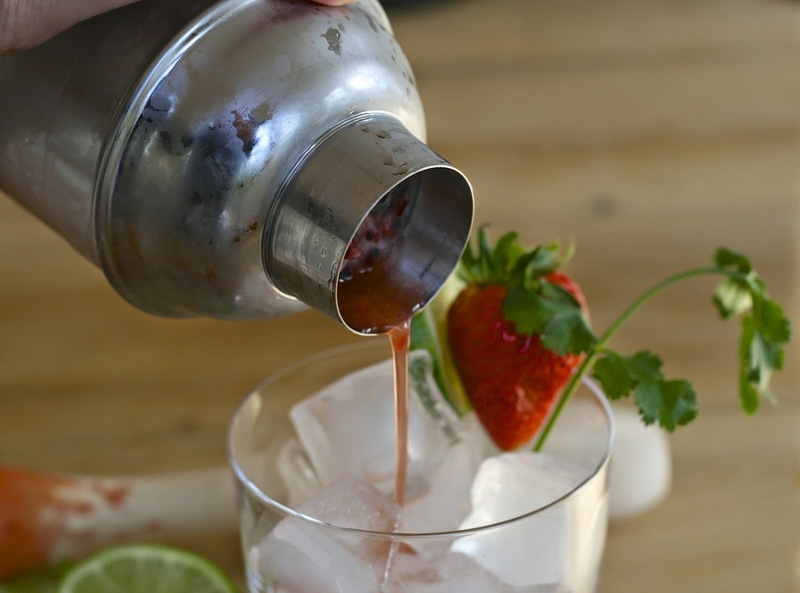 Shake for about 20 seconds and strain into a prepared glass with ice and garnishes. (If you like salt or sugar with your margs, rim the glass first... I usually take mine without). *Simple syrup is equal parts sugar and water. All you do is combine a cup of sugar, a cup of water and heat until sugar dissolves. Allow to cool. I store mine in the refrigerator in a squeeze bottle. And that's it! Couldn't be easier. Perfect for your Cinco de Mayo celebrations this weekend. Salud! Hull and quarter two large strawberries and throw them in the bottom of a cocktail shaker along with four sprigs of cilantro. 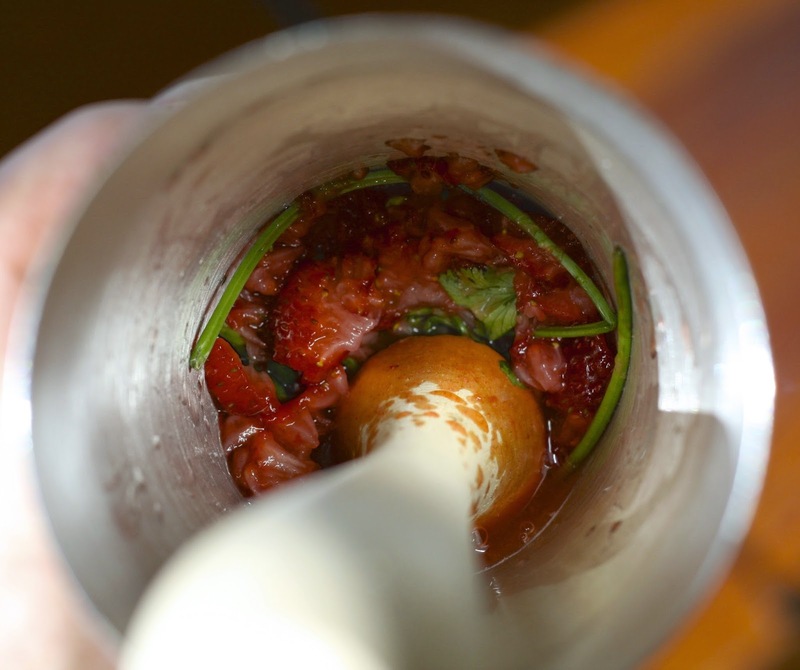 Muddle until strawberries are thoroughly mashed. Add lime juice, simple syrup, Grand Marnier, tequila and ice. Replace lid and shake vigorously for 20 seconds. 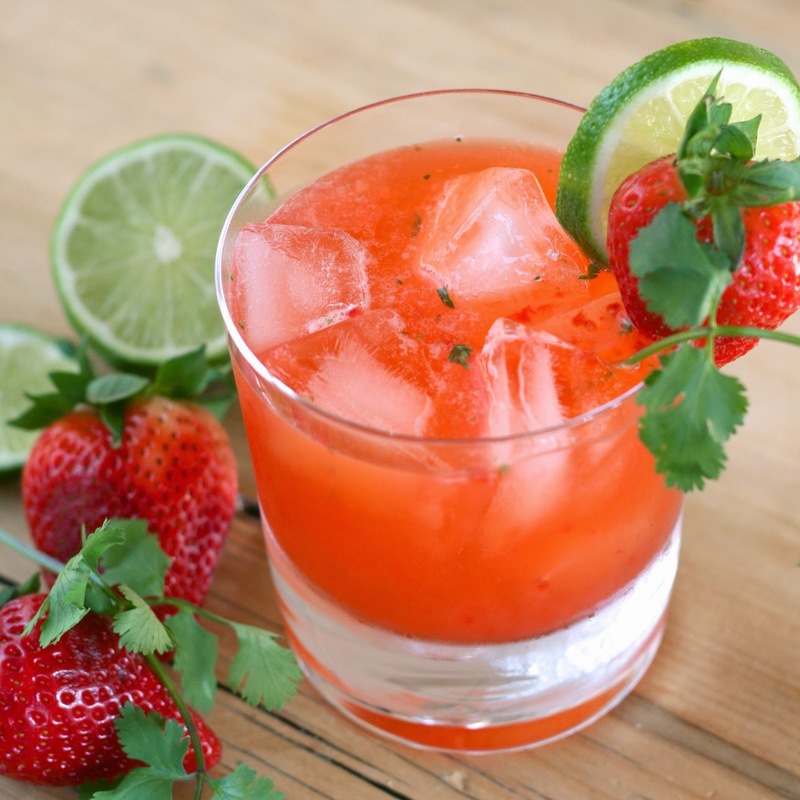 Strain into a glass filled with ice and garnished with a strawberry, lime wheel and sprig of cilantro. Enjoy!